(Nanowerk News) Supernovas -- the violent endings of the brief yet brilliant lives of massive stars -- are among the most cataclysmic events in the cosmos. Though supernovas mark the death of stars, they also trigger the birth of new elements and the formation of new molecules. In February of 1987, astronomers witnessed one of these events unfold inside the Large Magellanic Cloud, a tiny dwarf galaxy located approximately 160,000 light-years from Earth. Over the next 30 years, observations of the remnant of that explosion revealed never-before-seen details about the death of stars and how atoms created in those stars -- like carbon, oxygen, and nitrogen -- spill out into space and combine to form new molecules and dust. These microscopic particles may eventually find their way into future generations of stars and planets. Recently, astronomers used the Atacama Large Millimeter/submillimeter Array (ALMA) to probe the heart of this supernova, named SN 1987A. 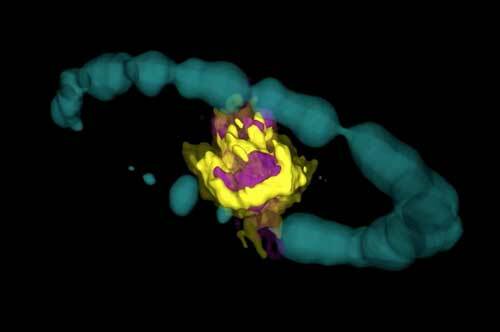 ALMA's ability to see remarkably fine details allowed the researchers to produce an intricate 3-D rendering of newly formed molecules inside the supernova remnant. These results are published in the Astrophysical Journal Letters ("Very deep inside the SN 1987 A core ejecta: Molecular structures seen in 3D"). The researchers also discovered a variety of previously undetected molecules in the remnant. These results appear in the Monthly Notices of the Royal Astronomical Society ("ALMA spectral survey of supernova 1987A — molecular inventory, chemistry, dynamics and explosive nucleosynthesis"). "When this supernova exploded, now more than 30 years ago, astronomers knew much less about the way these events reshape interstellar space and how the hot, glowing debris from an exploded star eventually cools and produces new molecules," said Rémy Indebetouw, an astronomer at the University of Virginia and the National Radio Astronomy Observatory (NRAO) in Charlottesville. "Thanks to ALMA, we can finally see cold 'star dust' as it forms, revealing important insights into the original star itself and the way supernovas create the basic building blocks of planets." Prior to ongoing investigations of SN 1987A, there was only so much astronomers could say about the impact of supernovas on their interstellar neighborhoods. It was well understood that massive stars, those approximately 10 times the mass of our sun or more, ended their lives in spectacular fashion. When these stars run out of fuel, there is no longer enough heat and energy to fight back against the force of gravity. The outer reaches of the star, once held up by the power of fusion, then come crashing down on the core with tremendous force. The rebound of this collapse triggers a powerful explosion that blasts material into space. As the endpoint of massive stars, scientists have learned that supernovas have far-reaching effects on their home galaxies. "The reason some galaxies have the appearance that they do today is in large part because of the supernovas that have occurred in them," Indebetouw said. "Though less than ten percent of stars become supernovas, they nonetheless are key to the evolution of galaxies." Throughout the observable universe, supernovas are quite common, but since they appear - on average - about once every 50 years in a galaxy the size of the Milky Way, astronomers have precious few opportunities to study one from its first detonation to the point where it cools enough to form new molecules. Though SN 1987A is not in our home galaxy, it is still close enough for ALMA and other telescopes to study in fine detail. For decades, radio, optical, and even X-ray observatories have studied SN 1987A, but obscuring dust in the remnant made it difficult to analyze the supernova's innermost core. ALMA's ability to observe at millimeter wavelengths - a region of the electromagnetic spectrum between infrared and radio light - make it possible to see through the intervening dust. The researchers were then able to study the abundance and location of newly formed molecules - especially silicon monoxide (SiO) and carbon monoxide (CO), which shine brightly at the short submillimeter wavelengths that ALMA can perceive. The new ALMA image and animation show vast new stores of SiO and CO in discrete, tangled clumps within the core of SN 1987A. Scientists previously modeled how and where these molecules would appear. With ALMA, the researchers finally were able to capture images with high enough resolution to confirm the structure inside the remnant and test those models. Aside from obtaining this 3-D image of SN 1987A, the ALMA data also reveal compelling details about how its physical conditions have changed and continue to change over time. These observations also provide insights into the physical instabilities inside a supernova. Earlier observations with ALMA verified that SN 1987A produced a massive amount of dust. The new observations provide even more details on how the supernova made the dust as well as the type of molecules found in the remnant. "One of our goals was to observe SN 1987A in a blind search for other molecules," said Indebetouw. "We expected to find carbon monoxide and silicon monoxide, since we had previously detected these molecules." The astronomers, however, were excited to find the previously undetected molecules formyl cation (HCO+) and sulfur monoxide (SO). "These molecules had never been detected in a young supernova remnant before," noted Indebetouw. "HCO+ is especially interesting because its formation requires particularly vigorous mixing during the explosion." Stars forge elements in discrete onion-like layers. As a star goes supernova, these once well-defined bands undergo violent mixing, helping to create the environment necessary for molecule and dust formation. The astronomers estimate that about 1 in 1000 silicon atoms from the exploded star is now found in free-floating SiO molecules. The overwhelming majority of the silicon has already been incorporated into dust grains. Even the small amount of SiO that is present is 100 times greater than predicted by dust-formation models. These new observations will aid astronomers in refining their models. These observations also find that ten percent or more of the carbon inside the remnant is currently in CO molecules. Only a few out of every million carbon atoms are in HCO+ molecules. Even though the new ALMA observations shed important light on SN 1987A, there are still several questions that remain. Exactly how abundant are the molecules of HCO+ and SO? Are there other molecules that have yet to be detected? How will the 3-D structure of SN 1987A continue to change over time? s Future ALMA observations at different wavelengths may also help determine what sort of compact object -- a pulsar or neutron star -- resides at the center of the remnant. The supernova likely created one of these dense stellar objects, but as yet none has been detected.